Head east from Fremantle along Canning Highway, then left along Preston Point Rd, to turn right onto Pier St. Bellavista 8b is 50m up the hill on the left. It is built on 2 levels. Located in East Fremantle this 4 bedroom, 2 bathroom, two storey townhouse is 200 m from the Swan River. 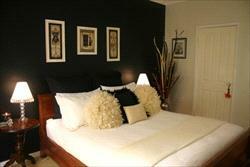 It is a half hour walk from Fremantle, and has wonderful river and ocean views, as well as a light and airy ambience. This East Fremantle Townhouse from the upper level has views of Fremantle Harbour, the Swan River to Rocky Bay, as well as the Indian Ocean to Rottnest Island. It has a balcony with an outdoor setting, lounge area, 4 bedrooms, Main Bedroom on ground floor has an ensuite. (2 x Queen, 2 x King Singles). Upstairs are bedrooms 2,3 and 4 with a second bathroom with a shower over a bath adn a vanity, seperate toilet. The lower level has a modern fully equipped kitchen, dining area, 2nd lounge, all of which opens out onto the garden. Additionally, there is a laundry and the second queen bedroom with its own courtyard garden, ensuite bathroom and built-in wardrobe. There is an outdoor entertainment area on the patio adjacent to the kitchen with BBQ and outdoor dining setting. December 2009 - Jackie, Mike and Susan - Southhampton and Portsmouth VIC. This is without doubt the best thought out and equipped house we have ever rented on holiday. We have had a fabulous time and will certainly be recommending it to anyone we know who is planning a trip to Perth. Thanks So Much! November 2009 - Yvonne, Greg, Vinje, Norm and Betty - Sunshine Coast QLd and Busselton WA. Thank you for allowing us the use of BellaVista. We completely enjoyed our short stay (5 nights is not enough!!) and the comfort of the accommodation. We were not left wanting for anything. Location is superb for early walks on the river, coffee at The Left Bank and the wonders of Free-o. We would like to return again. Alcock Family - Dubai, UK and Perth What a great place to stay - we, all 6 of us, Grandparents, Children and Grandchildren. We loved the attention to detail and the decoration! We are off to Margaret River and when we are back in Perth will be sure to give you a call. January 2009 - Stockport Family - UK Had another 3 weeks holiday in your lovely house. Thanks for having us again and hope to return in the near future. Humphirs Family - Hampton, VictoriaMany thanks for your lovely accommodation. Great details, comfort and impeccable cleanliness. Very Enjoyable! June 2009 - Scott, Mick and Jason - Brisbane QLDAll very good, lovely place. The decor is just like home "true" Very well equipped kitchen. Our third stay in Perth, First here. It sure is nice to come home to such a well equipped and comfortable place after a long day at work. We really enjoyed all that BellaVista had to offer and will try to stay here again. Thank you all. When booking for 2 persons, please note that this means a couple. If you are wishing Twin Share please notify when booking. Bedroom 1 - 1 queen bed with ensuite on ground floor, Bedroom 2 - 1 Queen bed, Bedroom 3 - 1 King Single bed, Bedroom 4- one King Single bed. Bedrooms 2,3 and 4 are on second floor with a second bathroom with a shower over the bath and a vanity, seperate toilet. Ideal for corporate stays both short and long term bookings. This East Fremantle Townhouse from the upper level has views of Fremantle Harbour, the Swan River to Rocky Bay, as well as the Indian Ocean to Rottnest Island. It has a balcony with an outdoor setting, lounge area, 4 bedrooms, Main Bedroom on ground floor has an ensuite. (2 x Queen, 2 x King Singles). Upstairs are bedrooms 2,3 and 4 with a second bathroom with a shower over a bath and a vanity, seperate toilet.